This entry will be short as it is my birthday and I have a full day ahead. But after yesterday, I needed to write today so I’m grateful to be able to sit in front of a computer. I wanted to share while I am still in the moment and feeling so lucky to be alive! I arrived on Christmas Eve morning in Uganda and on Christmas morning I gave my driver a couple of T-Shirts from the Uni ted States as a present. I knew I was taking away his Christmas and New Years and wanted him to feel like he had a present to open. Ronnie enjoyed the Thailand and Las Vegas T-Shirts that I gave him. A few days later, he offered me his hat that said, “I Survived the Bad Place”. It was a perfect cap for our long drives throughout our month long trip together. I was embarrassed to take it from him but I accepted graciously! This is the first opportunity that I’ve had to write home. I have not been able to get an internet connection until now. Ironically it is my birthday and I must say how truly grateful I am to be alive today for my 43rd birthday this January 15, 2009. 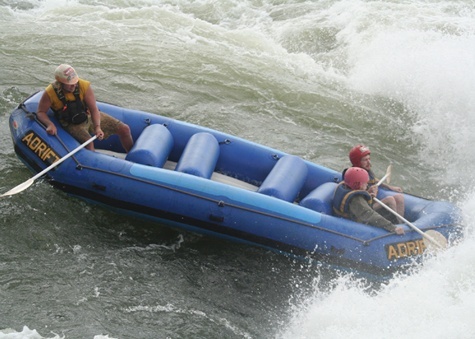 When rafting the Zambezi river in 1997, I remember my best friend reflecting on the “Sinuous, Tortured Gorges” that I was to face with names like Toilet Bowl and Three Ugly Sisters. Even flipping on two class five rapids and then flipping on Kaituna, a 5+ waterfall in New Zealand, could not have prepared me for what I was to face yesterday. The day in Jinja was a perfect combination of blue skies, white fluffy clouds that patterned a giraffe ’s hide, the hot African sun, warm Nile water, cool breezes and green canopies that lined the Nile as we floated calmly towards each rapid. 40 minute spans would have us frolicking in the sun and swimming around in the river with river guides splashing us with paddles. It was like being a child with floaties on without a care in the world. As we lay on our backs floating with the current, we passed the “real” life along the Nile; Naked boys jumping off rocks into the river; Ladies washing their clothes on one side of river beds and men fishing and washing their bodies on the other. Jugs carried on heads of youngsters to gather water for drinking and washing. It is amazing when Nile life floats by just before you crash into waves that could potentially drown you. Although I do have a flare for the dramatic at times, let me assure you that nothing I have experienced as of yet could have prepared me for what I was about to experience and this is a real account of what happened. I am not even sure I could I could write a true account of what happened. The day had been quite calm. 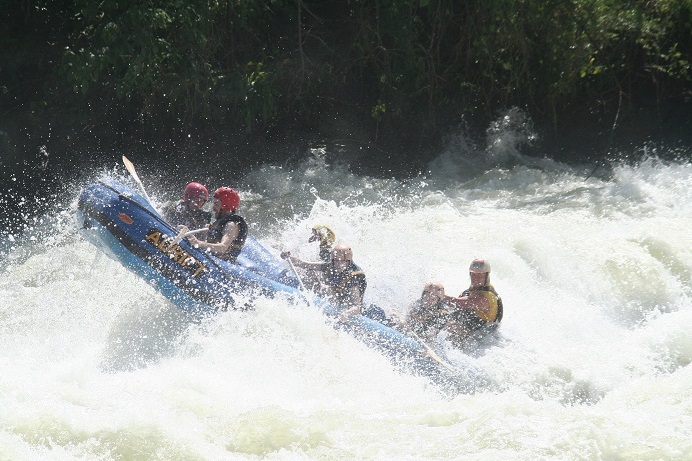 We hit a few 3 rapids and easily stayed afloat. We even conquered 2 fives in the morning. There were two of us in the front paddling our hearts out as the waves washed over us before we settled in the calm waters again. Before we knew it we were rafting to an island for a lovely laid out lunch of veggies and ham. Then it was back to the river. Feeling full and a bit tired we had yet to get to “The Bad Place”. 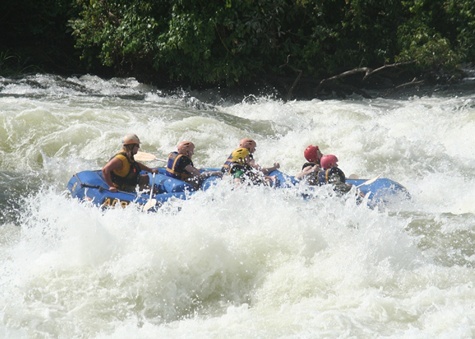 It is the sure flip, class five rapid that immediately follows an un-ridable class 6 rapid. There really is barely a split between the two. You walk over the rocks to see the 6 that would almost ensure sheer death. In the middle of the rapid you re-board but this time instead of 6, we were only 3. Three chose to ride in the safety raft and go through a class 3 while two of us plus our guide decided to risk the, what I know now as, unthinkable. I have knots in my st omach as I type. I even feel the lump in my throat that I had just before approaching the rapid. There really was no time to think. As I said, you are still in the middle of the rapid alongside the Nile when you re-board so as soon as I was given the instruction to push us off of the rocks with my paddle we were in it. I think only seconds passed as he screamed NOW, paddle forward Faster. “GET DOWN”, he yelled! Holding the T-Grip of the paddle with my left hand and my right hand gripping the tight rope on the side of the raft, I tried to hold on for dear life. The waves came before I knew it. You didn’t have time to take in the deep breath that you needed. Like foam from a crashing wave atop a surfer, we were encompassed! The water covered my head, my body, it whipped the oar from my hand and tore my hand from the rope. I was in the fury. I was under water. I thrashed around like a tiny washcloth caught up in the final rinse cycle of a washing machine. I gasped underwater taking it in through my mouth and nose. I actually remember thinking to stay calm, you will surface but I honestly did not know how. I was lost in the rapid. I was underwater and could not breathe. I could feel the strong current pulling me so far away from the reality of the safety of the raft. I was upside down and sideways. The strap of my helme t was actually making it harder to stay focused. My life jacket was lifting above my neck just adding another obstacle as I tried to find an air pocket anywhere. It just would not come. Then, it finally came. My head was up. I was kicking and fighting for my life to stay on top of the water. I barely had my eyes open and I saw the next wave hover over my head like a wave washing over New York City in a movie. I was once again, pulled back down. I had barely caught a breath. That short, single breath saved me. I was dug back underneath, this time with an even greater vengeance. I actually think I thought, “Thi s is it”. I did not know how anyone would find me. I think I thought I was going to drown. I have tears falling down my face right now as I type as it was so real. The fear was all consuming. Then just as I was sucked in for a third time, I was released from the fury of the wave my body tired and aching from the thrashing. What must have been only a couple of minutes felt like a lifetime of survival. The search was on. They said they were looking but could not see where I was. I was now coming to trying to distinguish up from down. I saw sky and franti cally searched for anything to grab on to. I saw a safety Kayak in the near distance and begged to get closer. I swam with all my might just to grab that tiny rope in the front of this single man kayak. My chest was heaving and I was struggling to release the buckle under my chin restricting my breathing. And it was over. I was safe. I gave a thumb’s up as I could not speak. My first words were, “Where is the other guy?” The safety pointed in the direction of the rapid, I saw him sitting in the raft. I did not understand how. He was flipped and came out quickly and they immediately pulled him back into the raft as soon as it was upright. I was so far away. I lay on my back as instructed with my legs wrapped around the front point of the kayak as he paddled me to safety to the raft. I was pulled onto the comfort of the inside of the raft. Again, I quickly fumbled to release the four clips restricting my breathing by the tight life vest that was too high on my body for comfort. I just lay back and let out such a sigh. My breathing was still labored and I could now see the safety raft with the guide, the two British girls and the Irish lad that chose to stay safe in the class 3. I laughed, I sighed and I really was in a bit of a shock. But I was fine and thrilled. They said how frightening it was for them to watch me. They lost me immediately after we flipped. They finally saw my head come up for a second and then nobody knew where I was again. They just had to wait like I did. The safety that saw me flip went to rescue me but the effort was futile. 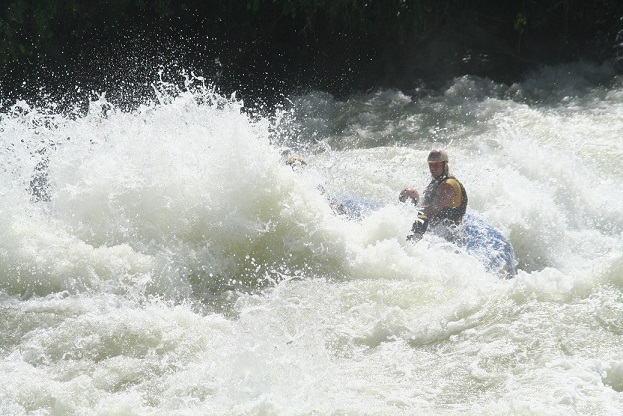 The fury trapped him in his kayak under the raft. They had to go in and get him out first. In the interim, I was lost. They had to wait for me to surface to know where I had been taken to so they said they went wide and spread out. 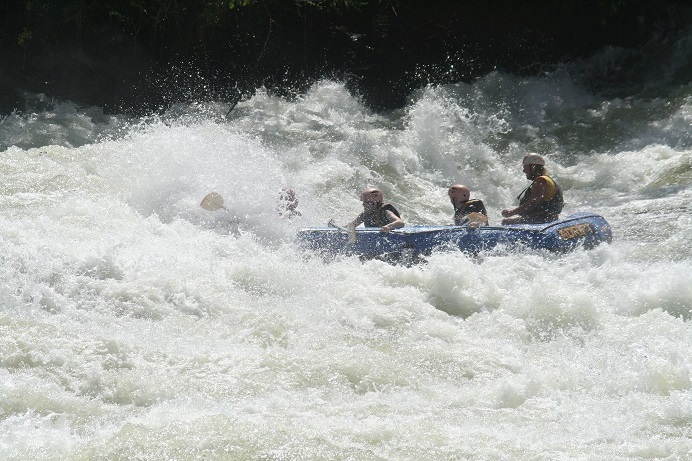 That was how I spotted a kayak when I came up out of the river so far from the raft, the rapid and the safety raft. The Nile current was strong and we were not done. The 5 of us gathered back in our raft with our guide. We still had work to do. As two of us were in front again, we led the pack in oaring ourselves to shore without being pulled down river. I was overwhelmed, I was tired, and I hurt. But the alternative was not an option. We had to paddle hard now to cross the river to the shore before we were pulled down stream. You just find the strength. You ignore the fact that you just almost drowned. You let go of the fear you just felt. You just breathe and are grateful that you are able to paddle with the crew of strangers you have spent all day with. The two of us in front were a bit speechless. We would just look at each other as though we survived the unthinkable. We actually did. At least I did. He said it was quick for him. He said he was up fast enough to see that I had been lost underwater. We climbed the rocks up the side of the river up to the road and the bus. I got to the top and breathed my first real breath. I leaned forward and water literally poured from my nose to the ground. My sinuses were burning from all of the water I took in. It was just surreal and it was over just as fast as it started. It was a crazy experience. I really was exhausted and yet ready to party. All day, the guides and I spoke of going out to the bars in Jinja town. They asked if I was still up for it and my only reply was you better believe it! I drank my very first beer on the 40-minute bus ride home. It was a Nile Special. I never had a beer before but it was well deserved! It was still beer though and I can’t imagine doing it again. I only resorted to that as there was no Vodka aboard the bus. When asked if I would ride that river again, I said, “Absolutely”. So, I don’t know what river is next but I do know, I’m up for the next challenge. I had survived “The Bad Place” and could wear my new hat proudly!